Even though tablet sales have been declining, the Apple iPad has managed to stay on top of most charts measuring the number of tablets shipped or sold during a given period. During those heady early years, Apple's iOS powered slate managed to grab a peak market share in the area of 95%. Seven months after the Apple iPad was unveiled by Steve Jobs, and one month prior to the unveiling of the Apple iPad 2, the OG iPad was seeing its slice of the pie slowly eroded by Android flavored slabs. By the first quarter of 2013, the iPad had under 40% of the market, down from the 58% share it held during the first quarter of 2012. Two quarters later, the iPad's market share was under 30%. And while cheap Android markets were the first to challenge the iPad, Apple's tablet has a worthy adversary in Microsoft's Surface Pro devices. The Surface Pro 3 was named by Time as one of the top 25 inventions of 2014. And the Surface Pro 4 was launched a little more than one month ago. According to the guys at WinBeta, they have seen an advance copy of a report by by the 101data Ecom Insights Panel. This report allegedly says that in October, Microsoft sold more tablets online in the U.S. than any other manufacturer, including former leader Apple. Microsoft's share of online tablet sales soared to 45% in October, while Apple's share dropped in half to 17% from September through October. During the same time period, Amazon's share doubled from 5% to 10%. Other data shows that Redmond is selling the most expensive tablets at an average of $844. The Surface Pro 3 wasn't cheap, and neither is the Surface Pro 4 and the hybrid Surface Book. The 512GB version of the Surface Book is priced at more than $2600 at Best Buy. The average iPad is priced at $392. While Microsoft took over the top spot in U.S. online tablet sales in October, over the last 12 months Apple still leads the category with a 34% slice of the pie. Microsoft is next with 17%, and Amazon's 11% share is good for third place. If Microsoft's momentum continues, we could see some major changes in U.S. online tablet market share during the next 12 months. Don't get so cocky man. I got so excited about 950 and it isn't bad but not great either. So, my hopes are not so high. Anyways, let's hope for the best. Ipad is merely an oversized ipod touch, that it, nothing more nothing less. In terms of productivity and functionality surface pro stands out. $3500 for an oversized overpriced Windows machine, no thanks. Apple's decline is not a great news for Android. There has to be a good competition if you want to see improvements. Like how Android oems compete against each other? They don't directly compete with Apple because they don't have ios. Competition is not always about the operating system. It's very obvious that you're new here. I just ordered a Dell 7140 to try out a pure Windows 10 tablet experience. It's cheaper than Surface Pro 4 so will see how it goes. 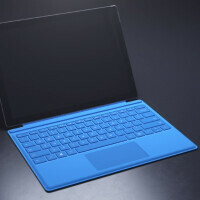 Surface Pro really seems to be the future! Well, you see...these things happen when people realise iPad and Android tablets are more or less for fun and Surface pro are the real deal when it comes to fun, productivity and work, even though it comes at a cost. Android tablets are cheap and good but I'd rather have Surface pro for the "real" job. The problem is that windows powered tablets from all manufacturers are rarely available outside US and China Here in Egypt the only proper windows tablet around is the Asus transformer book T100TAL and the T200TA and both have 32/2 Gb ROM /Ram and they are not really easy to afford like android plus only wifi versions are available... I use an android tablet because I need at least to have mobile data package with me so I can use it.. I take it no hotspot options? or hotspot lines? Real, uniform, software updates. None of this premature decrepitude to force upgrades. I can see this being true, in my opinion, anyone who buy a Google, or Apple tablet, are wasting their money, but it is their money to waste. Microsoft tablets do way more, if they had more apps it would be no contest. People cannot go around saying Microsoft crash or etc no more, since Windows 8 or 8.1 they have been just as secure as any Mac computer, and just as fast or smooth. No one can complain anymore, its either they hate Microsoft as a company or they still live in the past where Microsoft XP had a lot of virus and etc. I love Microsoft future, everything universal, is beautiful, I love how I can have my Lumia 950 phone on silent, while writing a paper on my laptop and while writing a notification will come up on my laptop saying I miss a call and offer the ability to text them straight from my computer without touching the phone. I think things will just keep getting better, I only did a 1 year contract with AT&T for the Lumia 950, so I hope they blow me away with next year Lumia 960 or Surface phone in November, since they always release their phones in November (Lumia 1520, 950, 950 XL) after announcing it in October, I wish they just announce it in November instead so we do not have to wait a whole month. and instead a week or two. The Surface Pro can run almost any Desktop App. I think that blows Apple and Android out of the water when it comes to App selection. Just because it isn't in the store doesn't mean it isn't an "app". It can run any desktop app. You just have to get one configured based on the type of apps you plan to use. Ahhh gotta love my WinBeta! Good good. Surface Pro 4 delivered!